ProQuest Congressional is the latest featured resource at PSU Library. Whether you are studying political science or interested in U.S. history, Congressional hearings are a valuable resource. Relive history with transcripts of witness testimony from Congressional hearings, like Howard Hughes’s testimony about the Spruce Goose. You can also see the processes of lawmaking with Congressional hearings such as the hearing about Nixon’s impeachment. Use ProQuest Congressional to look up legislative histories, specific bills, as well as full text of committee hearings and testimonies from 1824-1979. You can also look up members of congress, as well as find official social media accounts. In addition to important historical accounts, keep up with the latest news U.S. legislative information, regulations, and news. 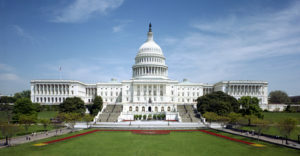 Finally, ProQuest Congressional updates daily when Congress is in session. You can rest assured that you have accurate information when you need it. Try ProQuest Congressional now (PSU login required off-campus). PSU Library’s United State Government Information guide is designed to help PSU researchers learn more about government in the U.S. Learn about government research and how to find specific information. Use this guide to also learn about U.S. government with a civics primer, information about all branches of government, and other government data. Portland State University Library participates in the Federal Depository Library Program. The Library’s government documents are located on the fourth floor of Millar Library. These include official documents from federal, state, and local sources as well as a variety of atlases and maps. The depository collection is open to the general public for research. Use our library catalog to find other government print publications around the library, as well as links to full-text documents available 24/7 online.